Football has always been a game for the masses. But how did a game for the masses function during the time of Stalinism in the Soviet Union? How did football and politics intertwine during the time of Stalinism and was football even a vehicle for political opposition? Football in the late 1920s and early 1930s had arrived from England onto the world stage. Hundreds of thousands of people flocked to see the games at the first inaugural World Cup held in Uruguay in 1930. In Europe the sport began to attract mass audiences, drawing tens of thousands of people for games in Austria, England, Czechoslovakia, Italy, and Germany. When the Bolsheviks consolidated their power in 1920 they realised the potential of the sport and the popularity of football with the working class; however, the Bolsheviks wanted to reform sport. The western system of international competition was seen as inherently capitalist and exploitative. After Lenin’s death in 1924 and the consolidation of power by the Bolsheviks and Stalin respectively, there was a shift from socialising sport to creating a sports system that was based mostly on western principles. It could be argued that football and sport were seen as a vehicle of competition and, by shattering records the Soviet Union could show the world the superiority of the Soviet living style. The communist leadership also realised the potential that football as a mass event, had as a powerful vehicle of propaganda. Furthermore, football reconfirmed old bourgeois habits of personal hygiene, leisure and entertainment, which the Stalinist regime was anxious to re-establish. Football became the vehicle of the state which was calculated to control and regulate leisure time of workers and soldiers. Football, however, was not entirely controlled by Stalinism; quiet the contrary, football perhaps provided the only space in the Soviet Union in which one could oppose Stalinism. For people who supported clubs that were not aligned with the central organs of the party, football was a small way of saying no to the culture of Stalinism. After the revolution, many sports clubs were taken over by proletarian members, or entirely new organizations were founded. Some of the earliest sports clubs or sports societies were supported by the Army or the Police. The first Voluntary Sports Society was founded in 1923 and was called Dinamo. Dinamo was the team of the police and the NKVD (the secret police) and fielded teams in various sports and cities. Similar Spartak societies were later set up in Ukraine, Byelorussia, and the Urals. It was Spartak that represented the Soviet Union in 1934, in what was officially called Soviet sport’s entry onto the world stage. A delegation of athletes including the football team of Spartak travelled to Czechoslovakia to play a friendly match with the highly ranked professional Czech side Zidenice Brno. The Czechs were among the top football powers of Europe, and the match drew considerable interest in both the Soviet Union and abroad. Spartak won the game against the Czech “capitalists” and the game was heralded as the validation of the strength of Soviet football. The match let to more exhibition games against European clubs and resulted in information exchange and experience that would prove highly influential in forming Soviet sport. In 1936 a combined Spartak-Dinamo side lost a game to Racing Paris in front of 60,000 spectators in Paris, which led to a substantial organizational restructuring and introduction of professional football in the Soviet Union – although officially all athletes in the USSR remained amateur. Starostin hoped that the establishment of a league based on western standards would lead to an improvement of the domestic game. The council accepted most of Starostin’s proposal, the league was restructured and Soviet sports would introduce western standards. In accordance with Starostin’s recommendation two annual championships were held, in addition to the USSR Cup, which was modelled and organized on the Olympic system and open to any team. The creation of a league meant the introduction of fixed schedules and regular championships. The rankings were regularly published in the sports sections of newspapers, and newly created sports dailies. This made it possible for people to follow a team and created a fan base. Also the introduction of the USSR Cup made it possible for football to spread beyond the big cities by bringing in a large number of contenders from all over the Soviet Union. Football and the creation of a competitive Soviet Football League was able to provide a leisure activity for the masses, and the competition between different football teams and the sporting drama that a long season would ensure established a social narrative. Alongside the already existing clubs new clubs were created; the railway industry got Lokomotiv, the vehicle manufactures of southern Moscow had Torpedo, further army and police branches in all major cities of the USSR also received clubs, the biggest being Dynamo Kyiv, Dinamo Baku, and Dinamo Tbilisi. The creation of Dynamo Kyiv is particularly interesting; initially founded in 1927, in the wake of modernizing the capital of the Ukrainian SSR, the club was to become the most popular club of Ukraine and the most successful football club in the whole Soviet Union. Although clubs were never recognized as being professional teams, players and coaches did receive wages, a fact that was openly known and even discussed in the press. Players were actually employed by the society they were playing for; players that played for Dinamo were hired as Physical Instructors and received their wages from the Dinamo society, which was owned by the Ministry of Interior. Financing came from whatever society would support the team; however, more popular clubs like Spartak were mostly self-sustainable through the large crowds that attended even their friendly matches. Being able to draw from massive financial resources; big city clubs and security police clubs dominated the league. 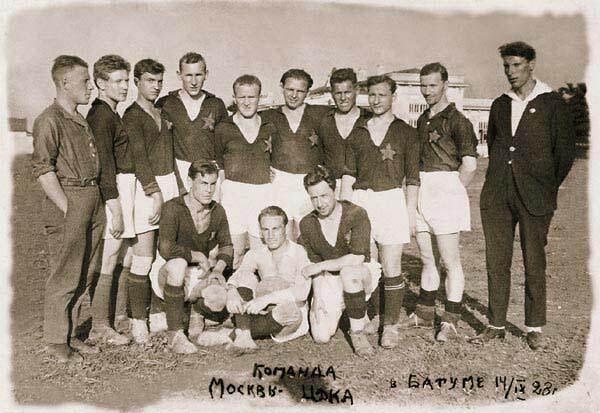 Moscow teams occupied six, and Dinamo teams five, of the top ten places.The league in fact mirrored the image of the Soviet Union under Stalinism; Stalin’s Russia was a centralized state run from Moscow and controlled by the secret police, it, therefore, comes as no surprise that this reflected heavily on the structure of Soviet football at the time. The creation of a football league and the mass following that accompanied it spawned the need for arenas and stadiums that could accommodate massive crowds. The industrialisation of the Soviet Union under Stalinism meant that cities were acquiring large working classes, with precious little entertainment offered and a functioning inter-city transport system, the stage was set for football to emerge as a mass spectacle sport in the Soviet Union. The Central Committee approved sport as a legitimate pastime, and the creation of football stadiums was considered a priority. In Kyiv, the new Ukrainian Stadium proved to be a massive investment – 12,237,600 rubles alone were spent on the first stage of the construction, making it the second largest non-industrial project in the city after the government building. In Moscow, spectator sport was played in relatively small venues, until the opening of the new Dinamo Stadium in 1928. 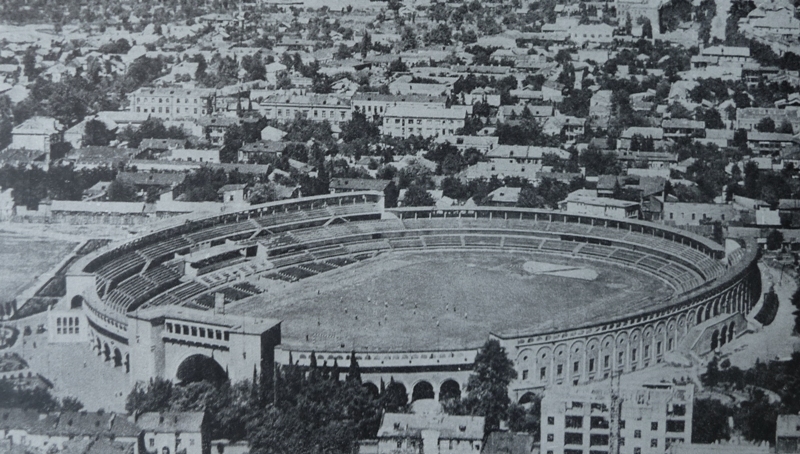 The stadium was constructed in Petrovskii Park, and initially had a horseshoe configuration with 35,000 seats. However, people would stand on the bicycle track that circled the field, which allowed for up to 50,000 (over the years as many as 90,000 people have been crammed into the stadium) spectators to watch football games. In 1935 it was decided that the arena was to be restructured for the purpose of football games, the track was removed and the arena enclosed, and in 1940 floodlights were added which permitted night games to be played as well. Besides its massive size the Dinamo Stadium had new dressing rooms, which included hot showers for the players. The Dinamo Stadium served as a model for stadiums build in Leningrad, Tbilisi, Baku, Yerevan, Odessa, Kharkiv, Stalingrad, and the above mentioned Stadium in Kyiv. Overall 650 stadiums with capacities over 1,500 were built during the next decade. The 1930s were an era of giant Stadium constructions, in the form of vast amphitheatres. The Kirov Stadium in Leningrad was build to have a capacity of 150,000, the Bagirov Stadium in Baku was designed for over 80,000. Plans were made to construct a Stadium that could hold up to 250,000 spectators in Moscow.. Located not far from the Partizanskaya Metro station close to the Izmailovsky Park construction of the stadium begun before World War II but were never finished. Today the stadium sits half completed just behind the giant towers of the Izmailov Hotel Complex. The Futbolgrad Network visited the complex in 2018 on the day of the World Cup final, and nowadays the stadium includes a museum of Stalin’s bunker, which is located right below the stadium and also displays a Red Army aircraft as well as two artillery guns. Nowadays it is hard to envision that the Izmailov Stadium could have become a facility for 200,000 visitors. Instead the authorities, however, focused on constructing a stadium at Luzhniki instead. It was that stadium that would host the 2018 FIFA World Cup stadium. 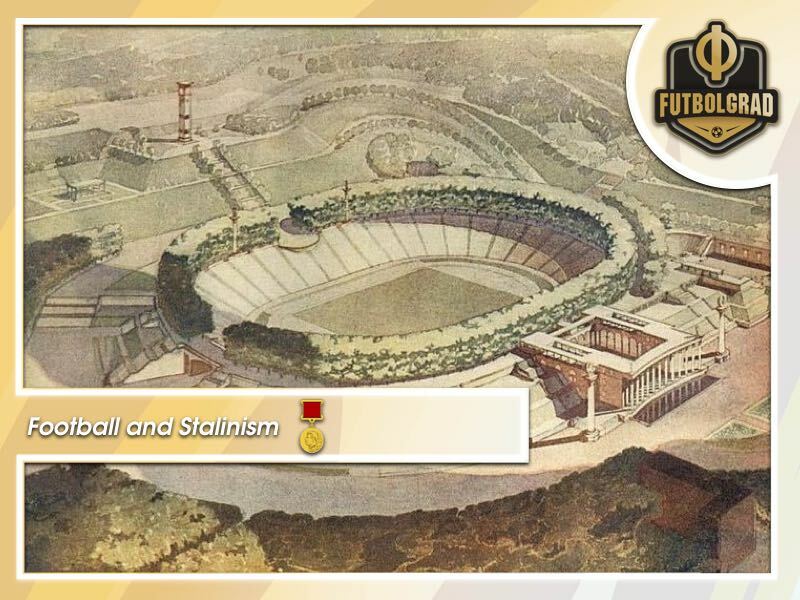 Back under Stalinism, however, these projects underlined the importance that the Central Committee saw in the development of the sport, and most of these stadiums were mainly constructed with football in mind. Spectators flocked to the game, and in 1938 the league had an average attendance of 19,000, and the next year 10,000,000 people attended at all levels of competition. The creation of large-scale stadiums was the last fundamental building block to the foundation of a modern football league under Stalinism. Stadiums meant that clubs could turn a profit, which was especially important for clubs like Spartak that were not at the mercy of a central organ of the Party like the NKVD or the Red Army. This meant that Spartak was not dependent on to the party leadership; it also meant that clubs could gather a large following which created fan support. Football under Stalinism – A form of escape or limited artistic freedom? Football was not an oasis of the apolitical. The Party was always able to benefit and use popular aspects to its end. There was even a “socialist realist” approach in that the state wanted to teach official values through the game. However, the popularity and the inescapable spontaneity of football that it demanded from the players were so great that the state could never fully use it as a tool of dominance and control. This, however, did not prevent the state from trying to interfere in football matters nonetheless. In 1936 Lavrentii Beria became the honorary president of Dinamo. Beria was no different from other party officials who “were like children, unable to tear themselves away from a sweet but far too rich cake.” They loved football, and tried to use their power to interfere with the work of players, coaches, and officials. Dinamo became Beria’s toy especially the Dinamo clubs in Tbilisi, his home town, and Moscow. Dinamo’s football was in line with “social realism” their game dour, and mechanical reflected Stalinism perfectly, at least that was the popular reception. Spartak, on the other hand, was the most successful club and played a style that was fluent and spontaneous. In the midst of the terror that was created by Stalinism success was a dangerous thing, and in November 1937 Starostin was denounced by a fellow athlete. He was accused of running Spartak like an entrepreneur, of allocating funds only to football, and of using his contacts to the army to obtain the best players – all accusations that were correct in one form or another but, in truth, all the other Soviet clubs acted no different. Further, he was accused of currency speculation. Starostin, however, was a good networker and had connections to both Nikolai Yezhov the head of the NKVD (the secret police) and Prime Minister Vyacheslav Molotov. Spartak won the league and the cup in 1938; however the political tide was turning. Stalin appointed Beria as head of the NKVD, with the remit from Stalin to slow down the purges. Yezhov and his supporters were arrested and executed; this was good for the nation, however, very bad for Spartak. An even greater shock for Spartak and Starostin; was the arrest and execution of Komsomol leader Kosarev in 1938. On March 20 1943, Nikolai went home from work at Spartak, went to bed and was arrested that very night. Nikolai spent two years in Lubyanka prison, mostly in isolation. He was charged initially with being involved with the enemy of the people Kosarev. He was accused of plotting the assassination of Stalin and other leaders during an exhibition game played during the Red Square parade of 1937. This was deemed too risky of an accusation to be made, seeing that Starostin was the most popular footballer in the country. He then was accused of praising bourgeois sport and endeavouring the values of capitalistic sport into the Soviet Union. His 80 rubles a month salary was also held against him even though this had been authorised by the government. Beria was not able to get Starostin executed. Beria was pitiless with party and state leaders and their relatives. Of course, the Starostin name could not stop him; yet the Starostins were more than mere human beings. In the minds of the public, they personified Spartak. That altered a great deal. Beria was dealing not just with a few prisoners, but with the support and aspiration of millions of fans, ordinary Soviet people. “I’m sure that it was the authority of Spartak that lightened our destiny”, Starostin later said. Starostin ultimately lived to tell this tale, Beria might have been powerful enough to imprison and execute political opposition or undesirable elements of the Soviet Union, but he could not bring down the most famous football player. Starostin was sent to a Gulag where, instead of doing hard labour, he did what he could do best: play football and train the local prison guards. Football under Stalinism was perhaps the only endeavour that was not under the absolute control of Stalin. Stalinism controlled the everyday life of workers, artists, government official, and members of the Communist Party. The Soviet Union did establish football with the intention of re-establishing old social morals. The Party Leadership hoped that athletes and their victories could be used as a propaganda tool towards the west. They, therefore, chose to compete with the west on capitalistic principles. Soviet football was entirely a product of the Soviet Union, designed as a mass spectacle that could be followed by tens of thousands of people at the same time in one place, hundreds of thousands in the entire country. The Soviet Football League, and its schedule were set and run by the Party authorities, football was regulated by the authorities in that it controlled when the masses got to see the spectacle. Stalinism, however, created a cultural event that was so big that they could not completely control it. The massive stadiums built became the cathedrals of opposition; fans could choose clubs that were not supported by the regime and use them as a way of saying no. Footballers gained so much support that they could be arrested but it was deemed unfeasible to execute them. Starostin was able to survive Lubyanka and the Gulags because of his popularity. Football players like Starostin were simply icons to the masses; footballers and football were loved because the game they played was spontaneous, its actions could not be regulated or interfered with. Keys, Barbara. “Soviet Sport and Transnational Mass Culture in 1930” Journal of Contemporary History Vol. 38, No 2, Sport and Politics. (July 2003): 413-434. Yekelchyk, Serhy. “The Making of a ‘Proletarian Capital’: Patterns of Stalinist Social Policy in Kiev in the Mid-1930s.” Europe-Asia Studies, Vol. 50, No. 7. (Nov. 1998): 1229-1244. Riordan, Jim. “The Strange Story of Nikolai Starostin, Football and Lavrentii Beria” Europe-Asia Studies Vol. 46, No.4, Soviet and East European History. (1994): 681-690. Riordan, “The Strange Story of Nikolai Starostin, Football and Lavrentii Beria” Europe-Asia Studies Vol. 46, No.4, Soviet and East European History: 681-690. Morton, Henry W., Soviet Sport. (Collier Books, New York. 1963),166. Louis Jennifer, Louis Victor, Sport in the Soviet Union. (Pergamon Press, Willowdale. 1980), 31. Goldblatt, David, The Ball is Round. (Penguin Books Ltd, London. 2006), 315. Yekelchyk, Serhy. “The Making of a ‘Proletarian Capital’: Patterns of Stalinist Social Policy in Kiev in the Mid-1930s,” 1229-1244. Edelman, Robert, Serious Fun: A History of Spectator Sports in the USSR. (Oxford University Press, Oxford. 1993), 66. Goldblatt, David, The Ball is Round, 315. Yekelchyk, Serhy. “The Making of a ‘Proletarian Capital’: Patterns of Stalinist Social Policy in Kiev in the Mid-1930s.” 1229-1244. Edelman, Robert, Serious Fun: A History of Spectator Sports in the USSR. (Oxford University Press, Oxford. 1993), 47. Edelman, Robert, Serious Fun: A History of Spectator Sports in the USSR. (Oxford University Press, Oxford. 1993), 48. Riordan, “The Strange Story of Nikolai Starostin, Football and Lavrentii Beria”: 681-690. Applebaum Anne, GULAG A History. (Anchor Books, New York. 2004), 269. Excellent read, Manuel! Once again, a quality and original content. I am glad to see how far Futbolgrad has improved itself as one of the most proeminent sites regarding soviet football.